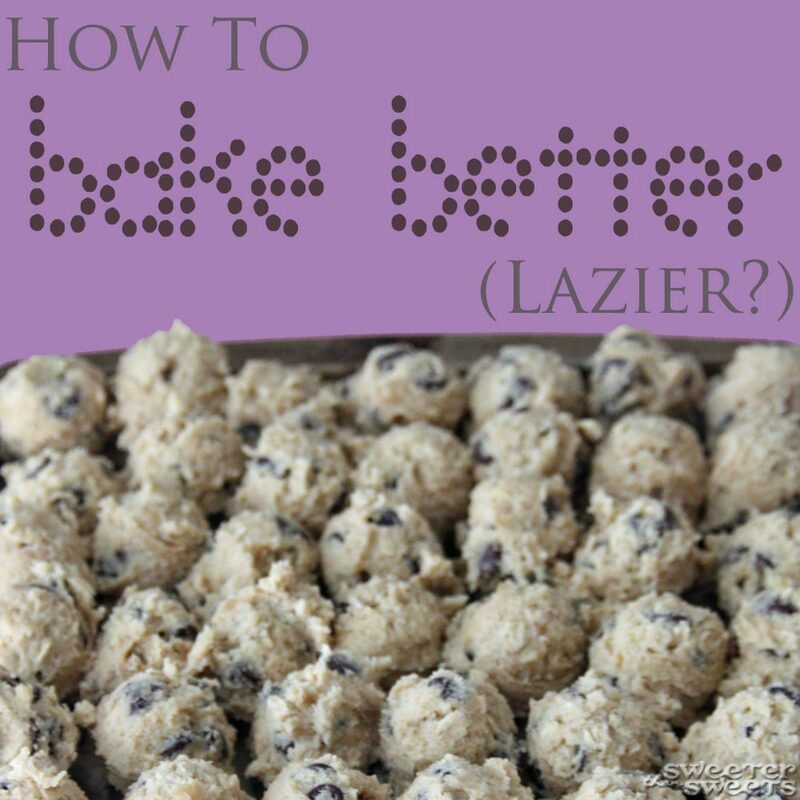 I've said it before: I'm a lazy baker. But sometimes lazy is good because it saves time and maybe even some calories. Whenever I make cookies or scones (which is probably more often than it should be), I only bake a few since it's just the 3 of us. Then I scoop all the rest of the dough onto a small cookie sheet and freeze the whole tray of pre-scooped dough. You can have fresh-baked cookies whenever you want! I think it saves me calories since I am less likely to eat a bunch of cookies "before they go bad." Ha! You can squeeze in a ton of scoops on one baking sheet, just place the scoops right next to each other. Cover the sheet with some plastic wrap and pop it in your freezer overnight. Then the next morning, take them off the cookie sheet and put them into a big freezer-quality zip-top bag. The frozen dough balls usually come off easiest when you twist them. I've never greased the cookie sheet (remember, I'm a lazy baker) but that might work, too. Write the cooking temperature and time on the outside of the bag so you don't have to take the recipe out each time you want to bake a few cookies. Make sure you write down if the cookie sheet needs to be greased before baking. You may also want to write the date you made the dough in case they get buried in the freezer somewhere. 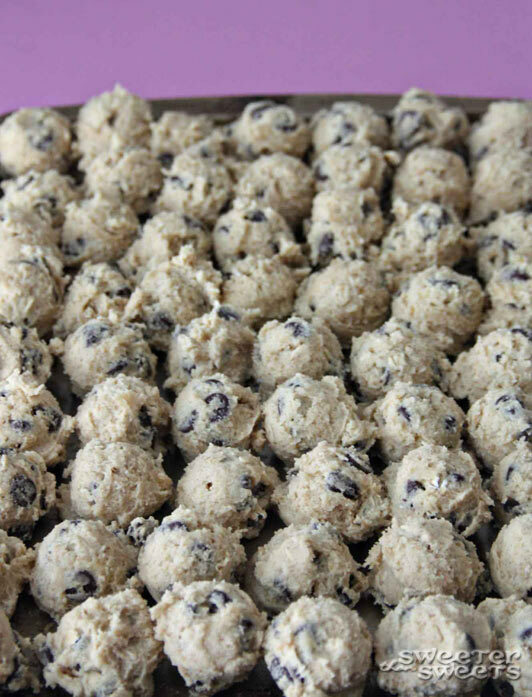 When you're ready to bake the cookies, put the frozen dough onto a cookie sheet and let it come to room temperature (usually 20-30 minutes). If you can't wait that long, just add a few minutes to the baking time and they should turn out great that way, too. You might want to press the centers down a bit to help them bake more evenly. What do you think? What's your best lazy-baker tip? That's awesome! I love quick tips like that. I do this for meatballs too. Works like a charm. My tip is to freeze everything in gallon zip-loc bags, flattened. You can store so much more that way. Super awesome tip! Like Janet, I have done this for meatballs but never thought about it for cookies! Smacking myself in the head! Why didn't I think of that?! Thanks so much. This is such a great idea! Cookies sound delish right now... I wish I had some in the freezer! :) Thanks for sharing! I do the exact same thing!! Especially during the winter months when it is soooo nice to have two hot baked cookies after dinner. hello, thank you for stopping by and commenting. i am so going to miss living so close to the farm. i love this cookie idea. my husband's request is always to leave him a heaping scoop of dough. i am sure if i left the frozen cookies he would constantly snack on them as is! i also want to try your kale recipe. do you puree and freeze a lot? and, yes, i am totally addicted to pinterest! Thanks for sharing this! I usually end up eating way too many so this is a perfect tip for me! Visiting from Tatertots and Jello! The Creative Bloggers' Party & Hop became the coolest party on the block because of your participation. Thank you! Look at you miss smarty pants! This is such a great idea! There are only three in our family and i usually end up giving out to neighbors or sending it to work with my hubby so we don't eat them all! I can't believe I haven't thought of this AWESOME idea! I am your newest follower and would LOVE it if you stopped by and take a look around at my blog, if you like what you see become my newest follower! I LOVE LOVE this! I have been wondering the details on trying to freeze dough and I am going to give this a try! This is sooo smart, I never thought to do this! Thanks for sharing.